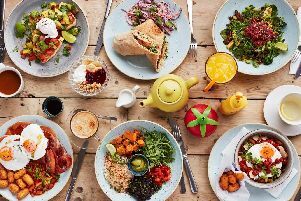 A global trend is on its way to Sheffield – one that combines a casual atmosphere with gourmet cuisine, variety, an emphasis on provenance and a fair amount of people-watching too. There are now hundreds of high-end food halls across the world, and two are expected to open here soon; one at Kelham Island, masterminded by the Milestone Group, and the other on Cambridge Street, part of the Heart of the City II scheme. Building on diners’ enthusiasm for independents –surely one of the drivers behind chains’ plummeting fortunes – food halls supply a vibrant combination of stalls, communal eating spaces and craft beer. Time Out Market in Lisbon has set the benchmark, offering 24 restaurants, eight bars, a dozen shops and a quality music venue. The closest thing Sheffield has at present, however, is the food court at the Moor Market, and the occasional Peddler street food events in Neepsend. The former is a very different proposition to a food hall, catering to a different clientele – but within it lies a gem that is just the kind of outlet our halls will be looking for. Hungry Buddha launched in the market two years ago, serving Nepalese curries to an initially doubtful response. Now customers have bought into the global outlook; the food is often gone by 2pm. Founder Dev Gurung, who was born in Nepal but moved to South Yorkshire in 2002 after meeting his wife Jan on a trek, started the venture to give himself – and others – a taste of home. The daily menu is agreeably straightforward, offering rice, dhal, pickle and a choice of meat or vegetable curry – or, for the curious, a bit of both. Everything is freshly cooked, attractively presented on a thali – a large metal tray – and ready to eat in the market’s seating area within minutes. Last Friday the options were Nepali chicken curry, cabbage and coconut or potato and peas – the chicken, although mild, impressed with a bountiful, slightly citrussy sauce, while the cabbage and coconut was a drier dish but incredibly moreish, the milky coconut appearing in thin shreds. Rice was plain, and the dhal was too thin, but the pickles, by turns incendiary and smoky, showed real expertise. And all this for £5. It’s worth wondering whether Hungry Buddha might one day leave The Moor to rub shoulders with real ale, luxury burgers and fine sushi in a stylish Sheffield food hall. Food is served from noon, Monday to Saturday. Visit www.hungrybuddha.co.uk for details.